Is your Apple computer having issues playing sound from the built-in speakers, except perhaps for the startup chime, but sound works through external speakers, digital output, or headphones? Is a red light visible from the audio line-out port when you disconnect devices? These steps may help you troubleshoot issues playing sound from the built-in speakers on your Apple computer. If an incorrect version of Mac OS X is installed onto an Apple computer, a number of issues including issues with audio could occur. If you determine the version of Mac OS X installed on your Apple computer is incorrect, you may need to perform an archive and install or erase and install. Be sure to back up important information before proceeding with either option. If you are still having issues after you have confirmed the proper version of Mac OS X is installed, make sure the computer is set to play sound from the right source. 1. Remove any external audio devices and cables from the USB, FireWire, or 3.5 mm audio ports. 2. Open System Preferences from the Apple () menu, the Dock, or from the Applications folder on your hard drive. If Internal Speakers is not an option proceed to step 4. For Mac Pro computers, proceed to step 5. If Internal Speakers is present but not selected, select it and test again. 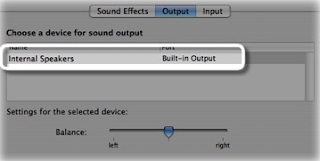 If the Output volume slider is low or the Mute box is selected, raise the volume slider or deselect the Mute box and test again. If the issue continues through these steps and Internal Speakers remains the selected option proceed to step 5. Confirm again that all external audio devices and cables have been removed. Check to see if a red light is lit in the line-out port. If so, your Apple computer may need service. If you do not see a red light, proceed to step 5. 5. If the issues persist, contact Apple support for further troubleshooting assistance.